I'd forgotten Mr EB had taken a couple of shots of the butterfly for me before we went off to the wedding on New Years Eve. The colours in this shot are far better than my poor attempts at capturing peacock feathers, although I always thought my hair was darker brown than this! I actually managed to get some hatting done whilst stuck in Papworth, but as usual it took ages for me to actually take some photos of it... 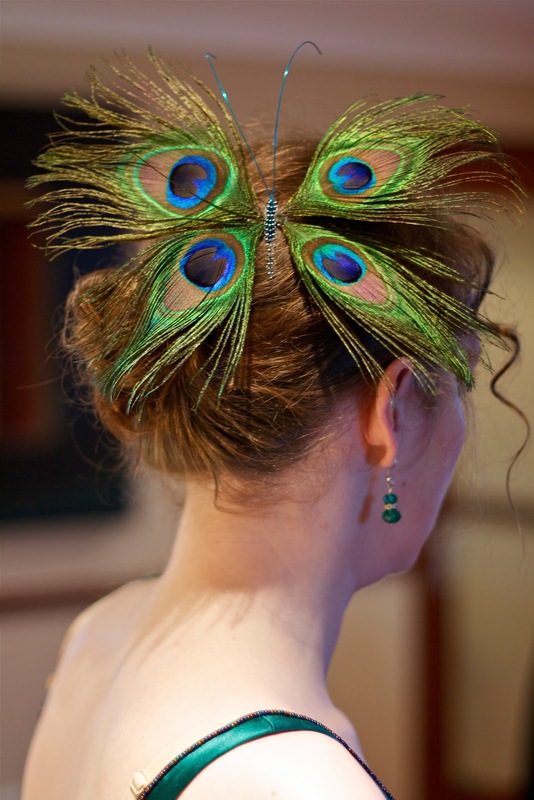 I made this peacock butterfly to go with the green silk dress I wore to Tom and Eden's wedding on New Years Eve (pictures of that to follow as well!). It was a bit of a fiddle to make, as attaching feathers to wire and then onto a delicate beaded body and then onto a comb was rather harder than anticipated. In fact, next time I make this design I will probably make a small buckram body onto which I will mount everything and then attach that to the comb. Hopefully this will make it less delicate without being too bulky! ﻿﻿Its very difficult to get the sheer beauty and colours of a peacock feather to come out in a photo- I'll try getting Mr EB to use his superior skill when he has a mo! You can also see the sticky tape I had to use to attach the comb to the dolly head temporarily... As it has no hair, comb based designs can be a pain to attach to the dolly, but I would rather use tape than put a wig on it!